"E122" redirects here. For the chemical element, see unbibium. 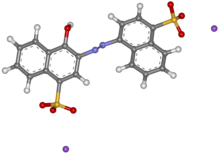 Azorubine is an azo dye produced only by chemical synthesis as a disodium salt. In its dry form, the product appears red to maroon. It is mainly used in foods which are heat-treated after fermentation. It has E number E122. In the US, this color was listed in 1939 as D&C Red No. 10 for use in externally applied drugs and cosmetics. It was delisted in 1963 because no party was interested in supporting the studies needed to establish safety. It was never used in food in the US. There are no provisions for azorubine in the Codex Alimentarius. No evidence supports broad claims that food coloring causes food intolerance and ADHD-like behavior in children. :452 It is possible that certain food coloring may act as a trigger in those who are genetically predisposed, but the evidence is weak. ^ Klaus Hunger; Peter Mischke; Wolfgang Rieper; et al. (2005). "Azo Dyes". Ullmann’s Encyclopedia of Industrial Chemistry. Weinheim: Wiley-VCH. doi:10.1002/14356007.a03_245. ^ Millichap JG; Yee MM (February 2012). "The diet factor in attention-deficit/hyperactivity disorder". Pediatrics. 129 (2): 330–337. doi:10.1542/peds.2011-2199. PMID 22232312. This page was last edited on 19 January 2019, at 20:40 (UTC).